"A Mine of Local Information"
There were many underground interconnections between the local pits, these being established for a number of different reasons. 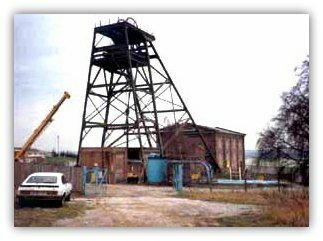 The workings of abandoned mines were absorbed into the take of other mines; connections made for escape purposes especially during the war, or for ventilation distant from the main shafts, such as at Nutbrook Air Pit (See Ventilation Furnace Cupola). With so many mines working the same seams in the area, the decision had to be made whether to leave coal barriers between them, or to allow one pit to break through into another's workings. This certainly happened with some of the superior quality seams, where reserves diminished but demand was high. Unless meticulously planned, this was a risky operation. 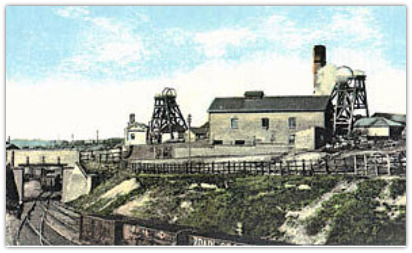 One such interconnection was between Manners Colliery, near the Rescue Station at Ilkeston, and Woodside. Manners had ceased coaling in 1949, and had partially flooded. I don't know which seam this particular roadway was in, (probably one of the deeper ones), and the Woodside and Manners workings were separated by heavy steel doors, probably somewhere in the area of the long abandoned Nutbrook Colliery. Two pumps at this intersection ejected water rising in the Manners workings before it reached a level whereby it would run downhill towards Woodside's active workings. The pump set-up was a duty/standby system, but with no automatic changeover if the duty unit failed. Presumably there was some means of signalling a pump failure, possibly a float switch, activated by rising water level in a local sump. Ashley recalled that if the duty pump failed, it was a mad rush to change over the pumps' valves and electrical supply. Remember, this intersection was probably over a mile from the Woodside shafts, horizontal distance alone. Any delays and you were up to your waist in mine water at the pump end.